It was one of those sights that makes you do a u-turn a mile down the road. 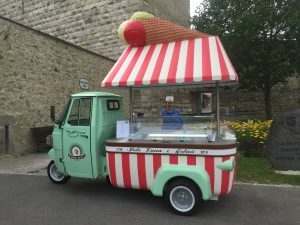 Not only was this the cutest little ice cream truck we’be ever seen on our travels, the ice cream was delicious as well. Posted in Austria Tours, Europe Tours and tagged austria, europe, Hainburg, ice cream, in, Piaggio, private, tours.